Walking into a museum and putting your hands on a priceless painting is normally, uh, frowned upon. But in Madrid right now, an unusual exhibit is inviting visitors to touch some of the most famous paintings in the world—so that the visually impaired can experience them, too. Visitors aren't touching the original paintings themselves, exactly. They're touching an extremely high-resolution replica of each painting. The exhibit at Madrid's Prado Museum, called Hoy toca el Prado, or Touch The Prado, is the product of a new printing process invented in Spain called Didú. Developed by a printing studio called Estudios Durero, Didú produces physical objects a bit like a 3D printer would—except using a completely different chemical process. 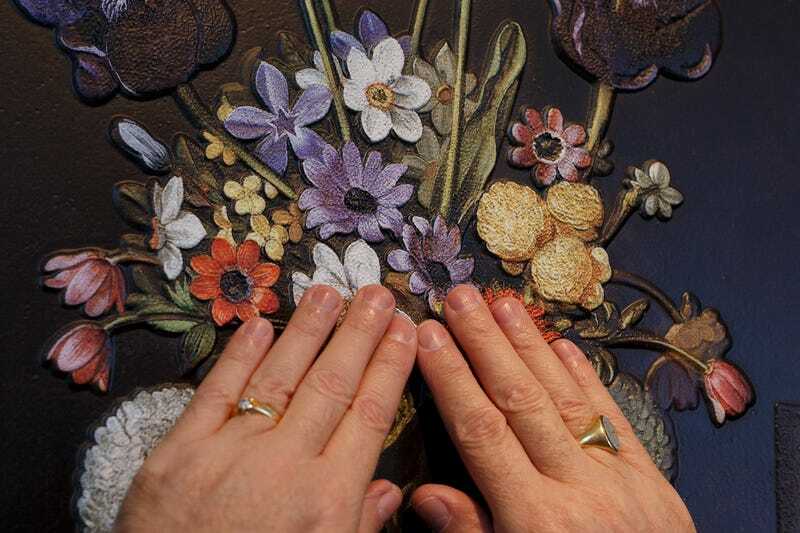 After this, we select the most suitable textures and volumes to guide the blind person's hands. In this aspect, small details, which may appear insignificant at first sight, can be fundamental in understanding the composition or the theme developed in each image. After around forty hours of work on each image, the volumes and textures are defined and printed with special ink. After this, a chemical method is applied that gives volume to the initially flat elements. On these, we print the real image with the original colours, at a suitable size so that it can be touched and reached with the hands. What results is a version of the original painting that looks quite similar, but also feels like the things it represents. In the Prado Museum, blind visitors can feel six different masterpieces printed with Didú, and sighted visitors can even put on masks and try their own hands. Why is their color? Well, as The New York Times explains, many visually impaired people can still perceive color. Instead of drawing a line between those that can see and those that can't, it's a show that can be seen—and felt—by both. You can read more over at The New York Times, or check out some images from the show below. Still life with Artichokes, Flowers and Glass Vessels by Juan Van Der Hamen. La Gioconda (Mona Lisa) by Leonardo da Vinci. Apollo in the forge of Vulcan by Diego Velazquez. Don't touch me (Noli me tangere) by Antonio da Correggio. The gentleman with his hand on his chest by El Greco.